Michaels, Jay | The Lambs, Inc.
Jay Michaels is a producer/director, marketing and public relations executive, entrepreneur & educator. He has been part of the indie theater and film scene since 1985. In 1997, he took the knowledge he acquired as a casting director for New York Daily News’ commercials and production associate for KSL Media and PBS and founded the boutique PR firm that now bears his name. Jay Michaels Arts & Entertainment (JMAE) creates visibility for self-producing stage artists and production companies on the East & West coasts and in multiple film arenas. Stage clients include Planet Connections Theatre Festivity; Downtown Urban Arts Festival; Fresh Fruit Festival; New York New Works Theatre Festival; Richard Skipper Celebrates; the Improvisational Repertory Theatre Ensemble; the American Theatre of Actors; Medicine Show Theatre; Opera at Hunter College; events at Broadway’s Town Hall; Spotlight-On Festivals; Playwrights/Authors Doug DeVita, Gary Morgenstein, Patrick Hickey, Jr., Anthony J. Piccione, and Dorian Palumbo; Cabaret Artists Lane Bradbury, Andrea Bell Wolff, and Rev. Mary and Granny’s Blue-Mers. Film clients include award-winning filmmakers, Eliana Ujueta (Beneath The Rock, The Airport Run) and Ben Goldstein (Jack London) and Steve Silver (The Watchtower). JMAE also produces live promotional events. Michaels presented live promo events for the HBO Summer Stage, Spotlight-On Film Festival, and the promo showings of UVX, a live theater and film hybrid, which was a sponsor of the 2017 New York ComicCon. In 1999, he and Mary Elizabeth Micari formed Genesis Repertory Ensemble, a non-profit arts organization dedicated to giving opportunities to emerging artists in the stage and film (and live event) industries. 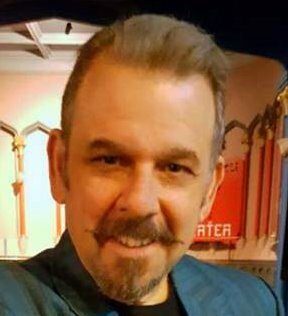 A professor of communications at Kingsborough College, Michaels continues to appear as a guest speaker and artist throughout the tri-state area at universities and arts organizations. What do you like most about being in the arts? The spontaneity in everything associated with it. Each project and each part requires new and innovative ideas; each project requires a gamble of sorts; each project needs you to think on your feet – even when you feel its all mapped out. I think that’s why I enjoy independent theater and film, you MUST have an agile mind. What kind of work do you to and what projects/shows are you presently working on? What was your first (or early) interest in the arts. What has been the most memorable experience in the arts (or anything else)? How did you learn about the Lambs? What are your hobbies or activities in your spare time? OK … I’ll say it. I am an avid comic book and movie monster magazine collector. I can speak ad nauseam about Marvel Comics and Famous Monsters of Filmland. My father took me to the trade shows and conventions when i was a kid and I simply never stopped going. To this day I drive passed Staten Island to get to New Jersey to the Chiller Theater Expo and prepare my best superhero t-shirt for NY ComicCon. Last year, I had the joy of producing an event for ComicCon for a new live action/film/internet hybrid called UVX. I had a VIP pass to the entire convention. Somewhere, my father was smiling.